Since more than 150 years, people are familiar with the healing effect of salt inhalation. Actual studies proof the noticeable impacts of sole applications, particularly with the treatment of respiratory deseases. Kemitron Technico VaporSystem control and regulate salt inhalation systems. Desired amount of sole, the interval for the sole nebulizations as well as the fineness of the sole fog is individually adjustable. A manual rinsing is retrievable, the rinsing time can be set. Air and water pressure are manageable. The fragrance intensity and the interval to the next fragrance dosing can be adjusted to customer requirements. The salt inhalation system is deliverable for 120 and 230 V AC. Because of the special manufacturing of the Kemitron sole solution, and salt inhalation system, a contamination while changing the sole storage tank is almost impossible. This also applies, when the container is stored over a longer period of time. The Kemitron salt inhalation system can overcome larger distances and height differences without difficulties, and without any loss of dosing accuracy. Therfore it is flexible adjustable to every existing installation scenario. 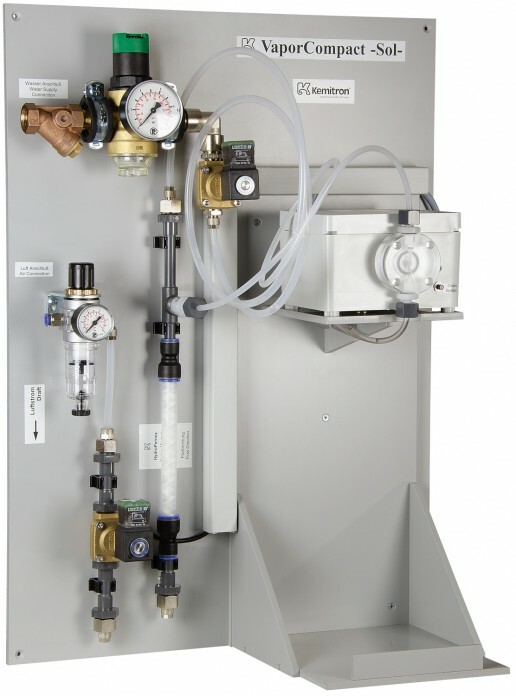 If the pipe between the salt inhalation system and sole nebulization nozzle can not stay short, it is possible to equip it with a legionella program. Our system nebulizes the sole solution with compressed air and therefore it reaches a sole solution drop size, which is significantly smaller than 5 μ/cbmm (0,012 μ/cbmm). The smallest possible size of the drops is important to reach the lungs and achieve a positive impact on the health. The positive impact of sole steam on diseases of the respiratory tract is already known since centuries. Sole steam contributes to alleviating complaints for respiratory diseases by stimulation of the fluid formation. It also mitigates dry cough by the anti-inflammatory and healing properties of the bicarbonate and calcium ions. And it cleanses the breathing passages from viscous mucus, while inspiring the bronchia to expansion and contraction. Sole steam has a tightening effect on both connective tissue and therefore supports skin lifting. Together with sunlight or UV light sole steam affects the irritated and inflamed skin positively.